I’m not sure many people were expecting for there to be a Bubsy return, but 2017 has been an awfully weird year in general. Accolade’s platforming mascot originally came to be in 1993, and while his 2D adventures weren’t much to write home about, he later became a laughing stock due to the horrendous quality of his lone 3D PS1 outing. Despite largely fading into obscurity, the character wound up becoming an internet punchline, and the gang at Arcane Kids even made a (pretty hilarious) parody title. 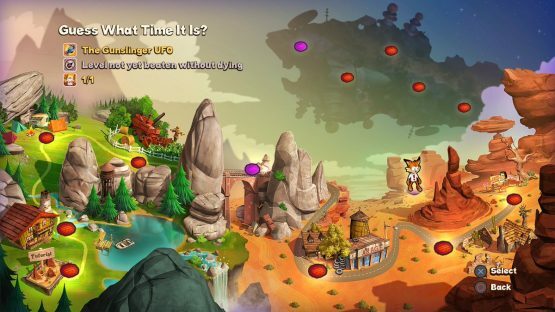 For better or worse, the talking bobcat has made his way back to consoles with an all new adventure called The Woolies Strike Back. There’s not much in terms of narrative, but Bubsy’s yarn winds up getting stolen by the titular aliens, and it’s up to the player to help him get back his prized possession. Unlike Wolfenstein, there’s little attempt to reinvent or make you care about a 20+ year-old gaming character. Instead, Bubsy throws the player right into the action. There’s a tutorial level if players want to get accustomed to the controls, but it’s all pretty simple. Other than the jump button, there’s two commands for Bubsy: a leaping pounce attack and a helpful glide move that lifts the bobcat into the air (I’m not sure that the science works out here, but I’m not a zoologist). These moves are actually surprisingly fun to pull off, as it’s really satisfying to jump in the air, go into a glide, and then land on an enemy’s head before going back into another glide. While this mobility is a lot of fun to use, it actually makes most of the platforming levels in The Woolies Strike Back pretty trivial. 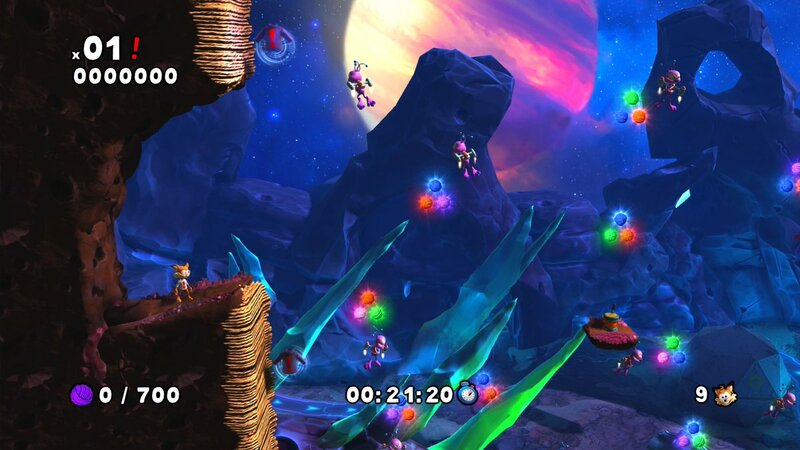 There’s a ton of collectibles to collect within the game, but since there’s absolutely zero reason to care about collecting the items, it becomes incredibly easy to just get up in the air and glide past enemies. Even Trophy hunters won’t find much of a reason to attempt to collect the hundreds of items in each level (which for the record is way too many) since the game lacks a Platinum. Hurting matters further is that if you try to play Bubsy as a more grounded platformer, the combat is exposed as pretty rough around the edges. Since Bubsy’s main attack is a pounce, he actually gets some air while he tries to attack. That makes damaging an enemy that’s simply to the left or right of the player into a frustrating affair. The regular jumping (when you’re not gliding) feels too floaty, and I wound up dying a lot of the times when I tried to simply jump on the head of one of the enemies. In the end, I just jumped and ran past them. There’s simply no reason to engage with the bulk of The Woolies Strike Back. While the actual platforming falls on the disappointing side, I found myself pleasant surprised with the boss fights. Unlike the main game, these fights take place on a singular screen, and force Bubsy to dodge attack patterns and eventually get some hits in on his huge foe. It’s a lot of trial-and-error gameplay, but it winds up being really satisfying when you get a boss’ attacks memorized. Sadly, there are only three boss fights in Bubsy. That’s not due to them being spread out throughout The Woolies Strike Back, as they appear every three to four levels. No, Bubsy is just ridiculously short. Despite being priced at $29.99, I was able to finish the game in less than two hours (I wasn’t timing it, but I’d estimate it to be around 90 minutes). Right when Bubsy starts to hit some strides (the later platforming levels are more fun than the early ones since they rely more on avoiding foes and using his glide ability) it suddenly ends as Bubsy reacquires his yarn. The poor value proposition aside, The Woolies Strike Back simply doesn’t offer up reasons to go back to the game after you complete it. There are trophies for beating every stage without dying, but a digital trinket wasn’t tempting enough for me to jump back into a largely mediocre offering. It’s really too bad since I was hoping that Bubsy could go from a punchline to a surprisingly enjoyable game. It would’ve been a feel good story in a year that has sorely lacked them. It’s easy to crack jokes about the return of Bubsy not turning out great, but I don’t feel that The Woolies Strike Back is a pure misfire. After all, the boss fights are filled with smart and satisfying design. If that type of level design was seen in the main game (and there was simply more to do in general), then we’d be looking at a very different game. There’s potential for Bubsy to be a relevant 2D platformer in the future, and I’d like to see Accolade take another shot at bringing the furball back to prominence. Bubsy PS4 review code provided by publisher. Reviewed Version 1.01 on PlayStation 4 Pro. For more information on scoring, please read our Review Policy.